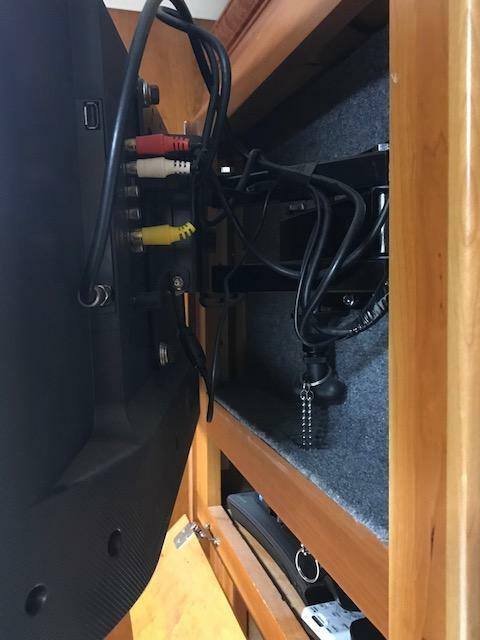 In a recent related post, Jleamont (Joe) mentioned that he had not upgraded his bedroom TV because he couldn't find a newer one that would fit in the space that his "tube" version was in. Deb and I ran into the same problem and once the tube style TV stopped working we were on a quest to figure out a solution. So, here's what we came up with. I'm sure I could have done this work myself but install credit goes to Action RV in Conroe, TX. We had the coach in for other items and it was easier to have them do this work concurrently. So, I thought this post may be helpful to others that want to get rid of their boat anchors. The TV is a Samsung 32. Actual diagonal measurement is a hair under 31". We bought the TV at Walmart for a ridiculously low price. The TV Mount is a Mor/Ryde 24-0111 swivel mount. It has a latch that secures the TV when driving down the highway. There's a pulldown latch on the mount. 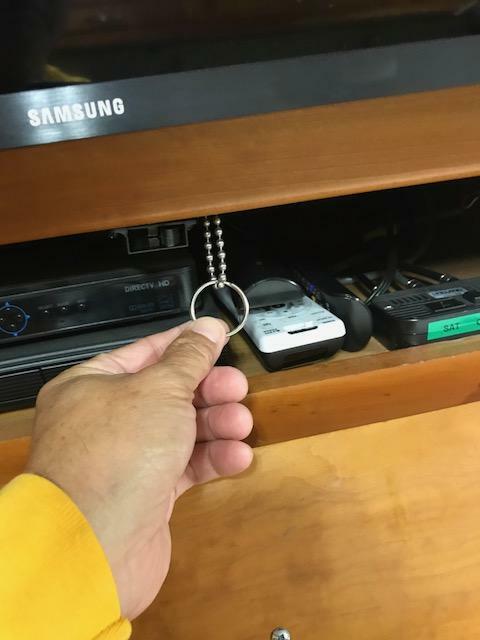 A small chain and key ring allows for simple access. A false back, made with plywood was installed in the old TV hole. Then covered with the same fabric that is used in our bedroom shelves. The area behind the TV gives us a hide-a-way storage too. Definitely 1911 wide (hidden meaning - most know). Here's my dilemma photo'd below. If I find one that fits the width it will be a small screen. I also love the simplicity of this TV. I will have to shop around and see what my options are. I love the locking swing out mount you installed! Now I see what you are talking about Joe. Major surgery. If your TV is still working you are golden! Have you thought about looking for a flat screen that will fit inside the current cabinet (vertically)? Then putting in a false back to mount the swing arm. When parked you could pull it out and when on the road you could push it back in and lock it. It works but only on Cable, no antenna since it is an analog TV. I would love to find a converter box and put it up front so it converted the digital signal to analog and sent it back to that TV, but it would need to be a box without a remote, I still need the ability to change the stations at the TV, not up front. I have a combo TV and CD player at home, will measure it and let you know by mail, I think it will slide into your cabinet...HD & Analog, got it at Best Buy in 2007, cost = free, I also got a 55" Sony for living room so they gave me the little one for a guest bedroom! Since my house on Galveston Island is for sale furnished...if it fits ? Joe/ Try Best Buy for the locking bracket. I used one like it in our travel trailer for the one year we owned it. Seems to me that is where I found it. You can make it work with OTA as well with an analog/digital converter if you really, really, must keep it. The controller could be in the closet and the box will allow Cable Pass-Through if you select the right box (off gets Cable, on gets over the air). You might find that you can fit a very nice flat screen in that space (overlapping the side rails on one or both sides) and either adding a filler above or putting a sound bar up there for good looks and great sound. There are a number of options out there but MY OPINION is that leaving an antique analog TV in that space is the worst of these options. I really got hooked on HDTV and can't imagine going back. Especially, OTA HDTV. I watch the Super Bowl using my Batwing as it's a much better picture than satellite HD. I keep the DTV Genie running as well in case I want to replay one of those special moments (think wardrobe malfunction). Joe, looks like there is some trim that can be removed. Would that give you a little more room to maneuver? 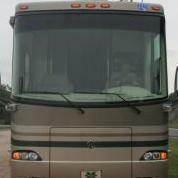 My previous RV had a 17" in a hole 36" wide by 21" high. It had the wide side and bottom like yours does and it weight 117 Pounds. It was digital with the old style "hump" back. Sales people would always walk up to me when I was measuring the total width and height to explain to me how to measure the viewing area. I had to laugh. Anyhow, I found one with about 1/2-3/4" sides and was about 1/4" shy of 36". I made a mount for an articulating arm so when we stopped we pulled the TV out and when traveling it pushed back into the hole. With the present trim you have and removed it would give you a little extra to play with and it rally doesn't have to go back in the hole. As for the cabinet door, well if it is blocked just put blankets or pillows up there that can be reached from the other door, or pull the TV out to access it. For securing I used a long adjustable tie-down about 1" wide with snap in clips. (Academy has them in my area) The tie down went around the mount and slipped through the little space on the sides. I just then snugged up the strap for when we were traveling. Just throwing out an idea. Keep looking. There will be one out there that can be used. Thanks Wayne and Bill. I think I'm going to do some searching for a suitable replacement. During the 2017 season I found us using the antenna a lot more than ever, not having that TV wasn't terrible but I'd prefer to have it. Take all the measurements not only for the opening but what you believe to be edge to edge clearance of any available space and then do some leg work. Take a tape measure as a 32' TV is not a 32" TV. Different manufactures have different layouts in all sizes so you just have to be patient and wait until you find that one that's just right. There are several options for mounting once you find a workable solution and we can discuss that further if you find something you think will work. Also when purchasing a new replacement the speaker placement is important. Anything that is permanently mounted the speaker should be facing the outside. Most of the new TVs have the speakers either on the side or on the bottom, and both are behind the frame. with a pull out mount there is no problem. In our situatoin I put in a full articulating TV mount. Another item that may be of concern is any peripheral equipment and how it is hooked up. Most of all the old TVs had RCA connectors (Red, White, Yellow) and the now-a-day have HDMI, Fiber, and COAX. Choose accordingly. 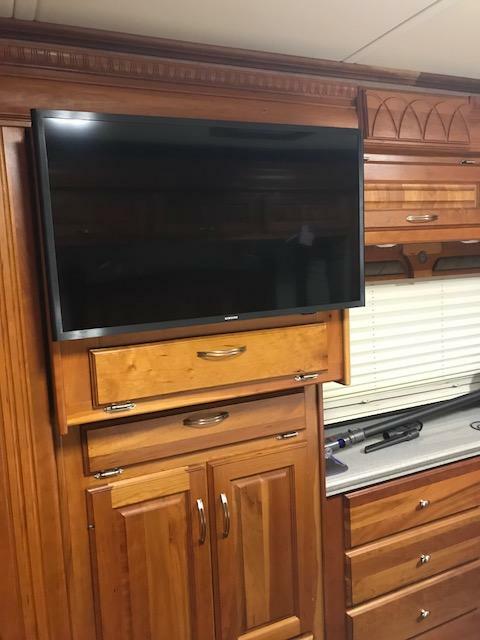 I have the same "original, custom fit" corner television in the bedroom of my 2007 motorhome -- a big, ugly, out-of-date 19" Panasonic hunk of junk. An HD to analog converter costs $40 to $50 at various electronics stores (Best Buy et al). I'd rather put those dollars towards the purchase of a new digital television if only I had an ounce of cabinet-maker skills! I am very interested in any and all ideas the forum has for converting a corner mounted analog TV to a flat screen TV. My solution was not as elegant as the fancy swing out mounts. We picked up a bargain (what was a bargain at the time) when Circuit City was going out of business. Floor model, fit inside the box. You can see results in my posting from many years ago here on the forum. Screen size is sacrificed but the increased resolution more than makes up for that. I had to use the base mount as the rear mounting apparatus on this TV was plastic. 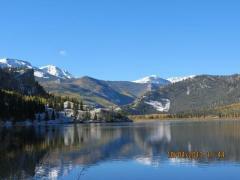 It would not have survived the frequent earthquakes we experience. With the space around the TV, I didn't have to worry about speaker location, it works fine in the small space of the bedroom and a viewing distance of about 10 to 12 feet. With the advent of the very thin led tv's, one can locate one that is pretty close to or slightly larger ones, then make a plywood door that fits the hole where the crt style tv is, then use heavy duty hinges to mount the door with the new thin screen tv to the door, which will give new cabinet space for more storage. Makes a great place for a .38, 1911 or a 9mm! Kay/ the former owner did that in our bedroom and mounted an LCD set on the door. Loads of space in the area behind the set. He saved me a lot of trouble and did a nice job. Ok, you guys talked me into it, here are the before and after shots. I cut the old trim and hung it temporarily until I figure out how I want to permanently close it off up top. I must admit the LED picture quality is unbelievable compared to that old TV. The main reason, I can now use my roof antenna, which might I add needs some TLC, she's all but seized. Carl, those shoes are in the closet, doors closed they go away . Then I'm stuck with mirrored doors with gold trim . Any suggestions on what to cover the hole with? I'm thinking stained to match beveled ends and top piece of wood. I've been scratching my head and that's all I've got.